Textures are used all the time by designers for both web and print projects. A effective use of texture adds character and makes a design more interesting and appealing (for some examples see our post 35 Websites with Outstanding Use of Textures). At Vandelay Premier we provide high resolution textures to our members and customers, and there are of course countless other places where you can buy textures. However, creating your own textures is also an option, and in this article we’ll provide some tips to help make your texture photography more effective. 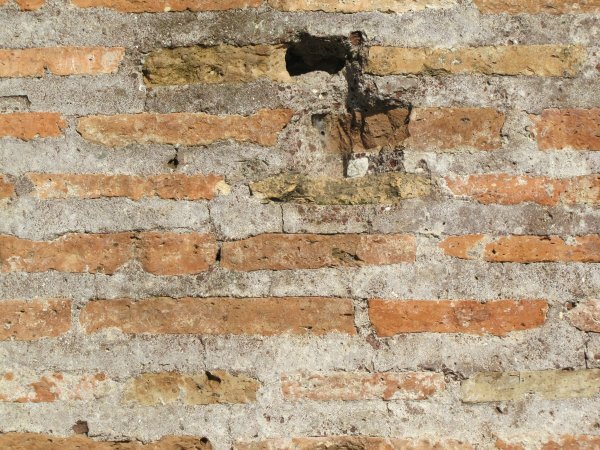 For the purposes of this article, we’re assuming that your goal for photographing textures is to use them in your own graphic design, or to distribute them to other designers. Someone who wants to photograph textures for the art of photography may approach things differently. We’re primarily interested in photos that will be highly useful for incorporating into graphic design. Scanning textures is also an effective option for flat objects like paper and fabric, but for this article we’ll focus on photographing textures. When it comes to photographing textures, here are the most important things to know related to the camera. One of the nice things about photographing your own textures is that it requires very little equipment. You don’t need a fancy, expensive camera. All you really need is a camera with a macro mode or a macro lens. Most inexpensive point-and-shoot cameras now include a macro mode, and chances are you already have one of those. If you’re not sure if your camera has a macro mode check the manual, or do a Google search for the model of your camera and the words “macro mode”. If you’re looking around the settings of your camera for the macro mode it is usually represented by an icon similar to the one below. With some cameras you may have to be in the manual mode in order to turn on the macro mode. When photographing textures you’ll want them to be in the highest resolution possible, which will make them more versatile. Set your camera to use its highest megapixel setting. At some time you may have reduced the number of megapixels in your camera’s settings in order to save space on the memory card, but for textures you’ll want the photos as large as possible. Cameras that take 5 megapixel photographs will be sufficient for almost anything you would need, but more megapixels will mean bigger textures. When shooting textures you will want the camera’s built in flash to be turned off. Natural sunlight will produce the best textures, so turn off the flash and get out at a time where the sun is providing enough light. The hours just after sunrise and just before sunset create ideal lighting for most types of photography, including textures. If you’re photographing textures in the middle of the day you may want to avoid extremely sunny days, because the light can be harsh in some situations. 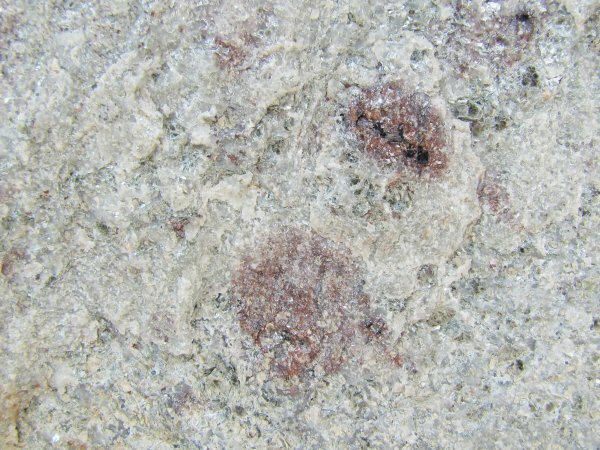 If you’re trying to photograph a texture and there is not enough sunlight, using the camera’s flash won’t really help for getting a quality texture photo. Using an external flash is an option if you have one and if you know how to use it effectively, but in most cases it’s best to simply stick with shooting at times of the day when the natural light is sufficient. When photographing textures you may not always have a tripod with you, but if you’re able to take one it may come in handy. Especially for taking photos in areas that are not as well lit, where you may need a slower shutter speed, a tripod can help in terms of the sharpness of the texture. If using a tripod, a remote trigger release can also help to eliminate any possible camera shake when taking the photo. If you don’t have a remote trigger release try using the timer on the photo as an alternative. It’s possible that you could take two (or more) shots of the same texture in different weather conditions or at different times of the year and get very different results. For example, shooting stone or concrete textures after rain when the subject is still wet will create a different look with different intricacies as opposed to one that is taken during normal dry conditions. 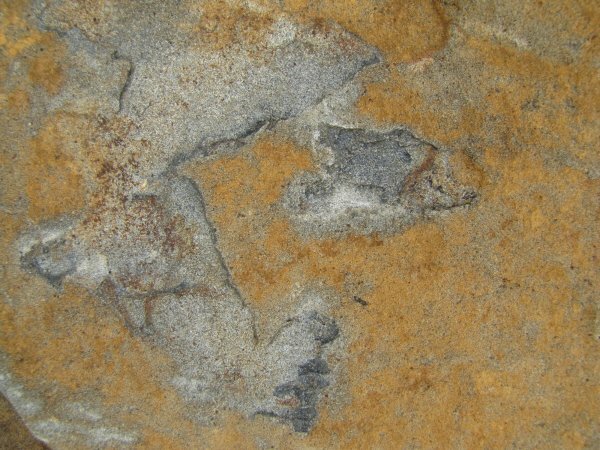 Likewise, a photo taken of dirt can be much different when it is extremely dry and cracked. Ice and snow also add elements to textured surfaces that make it unique. If you find a location that allows you to photograph a lot of great textures, trying going back again at a different time of year or when the weather has changed. You may be surprised at how much things can change and how your results may be drastically different. 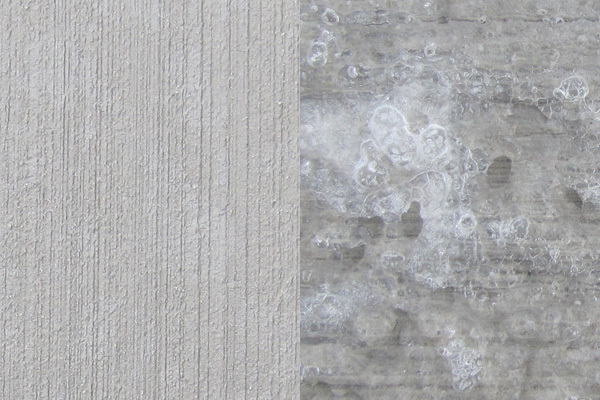 The photo below shows the texture of a regular, dry concrete slab (left) and the same concrete slab covered with a very thin layer of ice (right). As was already mentioned, tripods are ideal but not always available or practical. If you’re not using a tripod you may want to find something else that you can use to stabilize the camera, such as a ledge. Otherwise, focus on holding the camera as still as possible to get the best sharpness and quality of texture. Generally you will want the lens of the camera to be parallel to the surface of the texture rather than shooting at an angle, which will create some blurred areas. For example, if you are shooting a texture that is on the ground, stand directly over it and shoot straight down. Angles make for interesting photos, but for textures that are useful in graphic design you will usually want a photo that is taken straight on. In most cases when photographing textures you will want to be close to your subject, generally within a few feet. However, for larger objects like a textured wall you may want to be further away in order to get more of the object in the photo. These types of photos will often be ideal for using as backgrounds. Experiment by taking multiple shots of the same object from different distances. The two photos below were taken at the same location. 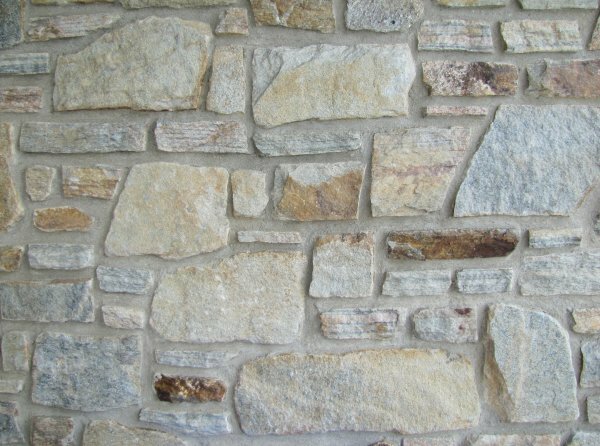 The first one shows the stone wall from several feet away, while the second is a very close-up shot of the texture of a particular stone. Shadows and reflections can limit the uses of a texture, so generally you will want to avoid them. The time of day and the amount of sunlight will obviously impact the way that shadows will affect your photography. For objects that are on the ground you can usually position yourself so that shadows, including your own, are going away from your shot. Vertical textures, such as a wall, can be difficult if the sun is in a position that casts a shadow onto the surface. In general, you’ll have less impact from shadows if you take the photos when it is partly cloudy or overcast. If your subject is in a dark or shady area you may need the sunlight, but otherwise cloudy days can be a great way to avoid shadows. Reflections can also be an issue with certain textures, such as metal. If you see a reflection coming off the surface try re-positioning yourself and you may be able to get in a spot where the reflection is better or not even an issue. Again, very sunny days tend to result in more reflections. The biggest tip for any type of photography is to get plenty of practice. You’ll learn a lot more from actually doing it than you can from simply reading an article like this one. 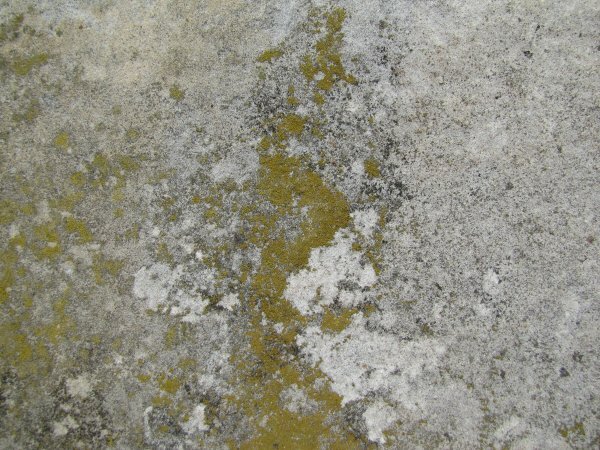 Experiment by going to different places, or just take photos of textures around your own house. Take photos from different distances, try different exposures, try different times and day and different weather. Soon you’ll have a large library of textures even if many of them don’t turn out to be usable, and you’ll learn what you like the best. While you can take photos of textures just about anywhere at any time, I recommend taking the camera and going out with the specific purpose of photographing textures, especially if you’re just trying to get some practice. This way you can take a large number of photos in a short period of time. 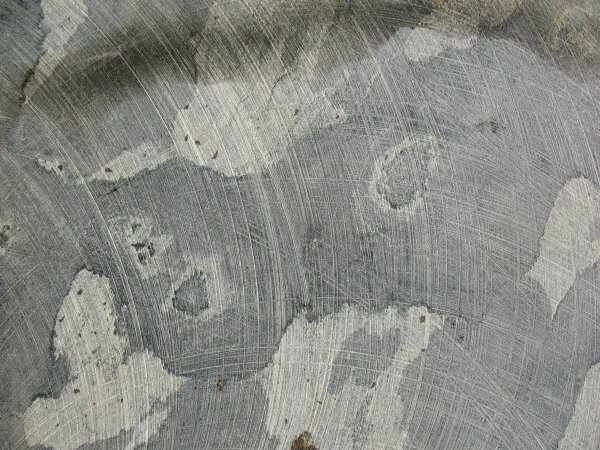 If your camera has a manual mode that allows you to adjust the exposure, try using it when photographing textures. While the auto mode will work on most cameras with a macro mode, manual control will often produce better results. By controlling the exposure you can get photos that look more vibrant and less dull. If you find a subject with a really nice texture, try photographing it multiple times with different exposures. Most likely it will be difficult for you to tell exactly what quality of photo you are getting until you get home and view it at 100%, but having several different shots at different exposures will give you the best chance to get at least one that is high quality. Although most of your work will be done with the camera, some of your textures may need to be adjusted in Photoshop (or your preferred Photoshop alternative). Probably the most common thing you will want to adjust is the contrast. You can use the brightness/contrast controls, levels, or curves. Sharpening an image using the unsharp mask filter can also help to create high-quality images. If you’re not familiar with the unsharp mask filter, this article provides a good introduction. Textures are literally all around us. You won’t have to go very far to find subjects for texture photographs, and certainly you could find some just around your own home. Parks and large public areas are a good place to start. Other options include urban areas (just walking down a city street or a back alley you can find plenty of variety in textures), farms, old buildings, parking lots, and really anywhere. The more you start to experiment with photographing textures the more you will start to notice opportunities just in your daily life. Keep your eyes open and be alert to textures and you may be surprised at where you notice them. The photo below was taken while visiting the Colosseum in Rome. Look for things that have something interesting or different from standard textures. The photo below was taken in a parking lot. The blue paint is from a handicapped parking space and makes it different from the typical pavement texture. Also look for patterns that create interesting and unique textures. The photo below was taken by Caleb Kimbrough for a Vandelay Premier texture set. The grooves give it a unique texture. 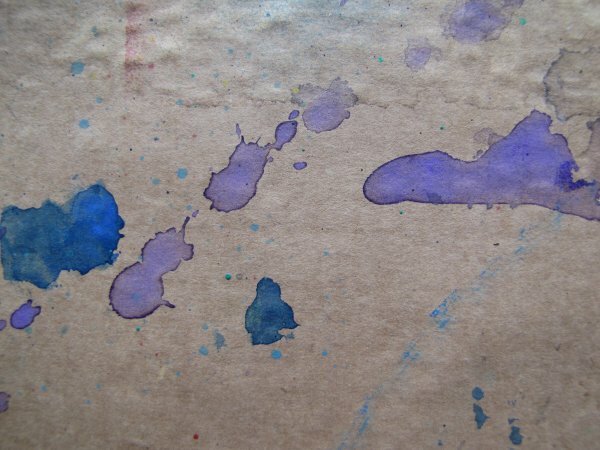 Take a piece of paper or cardboard and make it grungy by staining it with dirt or just wrinkling it up. If you’re looking for some items to play around with, try searching your basement or garage and you’ll likely find some old objects. The photo below was taken of some cardboard in my basement that was used when creating some Photoshop brushes. If you’re interested in creating your own textures for your design work the best thing to do is simply get started. Take your camera and get some practice. 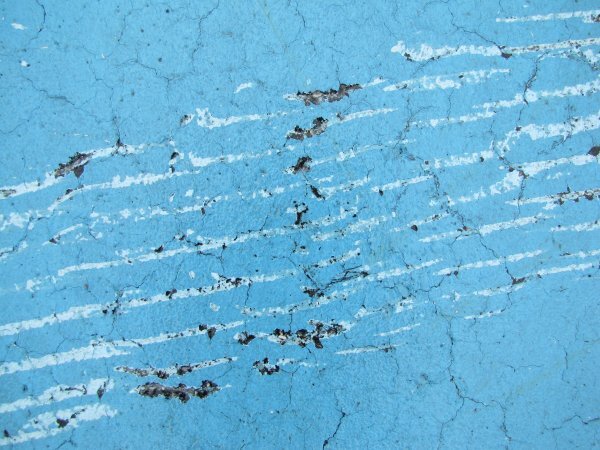 You may be surprised at where you can find amazing textures that enhance your design work.